The maker movement just keeps getting stronger, and open hardware and software are right in the middle, combining electronics, code, construction kits, and bits and pieces of whatever's in the spare parts bin to create something new or remake something old. In case you haven't already plunked down 35 whole dollars to get a new, faster Raspberry Pi 2 Model B (RPi2B), we give you the lowdown on its capabilities. Next, we compare the RPi2B with the Odroid-C1 to discover the strengths and weaknesses of both small-board computers. 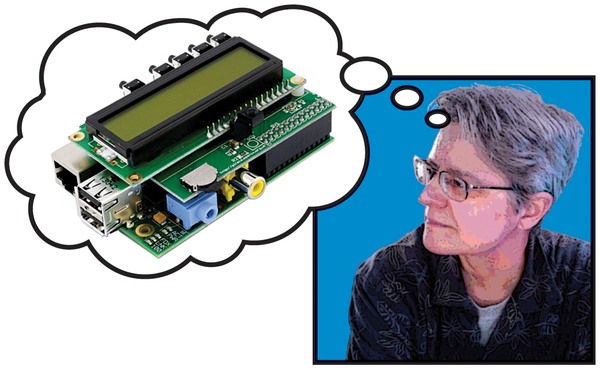 Our authors keep finding great add-ons for the Raspberry Pi. This time around, we look at the PiFace Control and Display unit, which adds input switches, an IR receiver, and a two-line alphanumeric display right on top of the Pi. Another useful module that piggybacks on the Rasp Pi is an uninterruptible power supply that shuts down your computer gracefully when the electricity goes off. If you've ever wanted to track moving objects, check out the Pixy camera connected to a Rasp Pi. We also show you how to plot the movements using Mathematica. On the software front, the anonymebox operating system on a Rasp Pi sets up an easy way to let your computers and mobile devices navigate the Internet anonymously. We also help you configure the new Firefox synchronizer on home computers, tablets, and smartphones. Advanced makers will want to continue discovering the abilities of the Rasp Pi's I2C bus, this time with a clock and timer chip. Another author hooks up an old large-format pen plotter to his Pi and discusses the code he wrote to control it. Now, most of you don't have old pen plotters lying around, but you might be interested in controlling a CNC machine in much the same way. If you are designing a surface-mount or printed circuit board, our article on the Design/Build process could help you get your product to market. Even if your project is stuck in the troubleshooting stage with unrevealing code debuggers and print commands, we can help you learn about the low-cost logic analyzers that let you directly measure the signals coming out of your board. Don't forget to bring the kids! This issue has another Scratch programming lesson that shows you how to create scrolling sprites for game play. It's also time to get ready for summer pool weather: Build an airboat with a couple of empty water bottles, a few construction materials, and an Arduino Uno. First one to the deep end wins. We also have some littleBits build projects that explore the logic modules. You have nothing to fear and lots to learn by diving in. Invite a friend or two and see what comes of your combined efforts – maybe the next great product. Curious makers gathered in the Big Apple for Maker Faire NY 2014. As of the Raspbian Jessie release, Scratch provides easy access to the Raspberry Pi's GPIO pins. This project incorporates the new GPIO server to build a motion detector.